The sun is the most enormous and direct, source of energy. Where does this enormous energy that the sun radiates come from? The source of this energy was not known to mankind until the year 1939. It was a German physicist, Hans Bethe, who proposed that the sun contains hydrogen nuclei in its core, moving at large speeds. Whenever these nuclei fuse to form a nucleus of a heavier element, a large amount of energy is liberated. Such a reaction is known a nuclear fusion reaction. Nuclear fusion is a reaction in which two or more light nuclei combine to form a heavy nucleus with the liberation of large amount of energy. Note : One gram of hydrogen releases 6.2 x 1010 J of energy where as one gram of coal produces 33 KJ of energy. Nuclear fusion takes place at a very high temperature which is equal to 4 x 106oC. Fusion is the combination of two like light nuclei and the nuclei must have sufficiently high kinetic energy to overcome the force of repulsion between the like nuclei. Therefore, for fusion reactions to occur, the two hydrogen nuclei have to collide at very high speeds, which is possible only at a very high temperature, equal to 4 x 106oC. Hence a fusion reaction is also known as thermonuclear reaction. 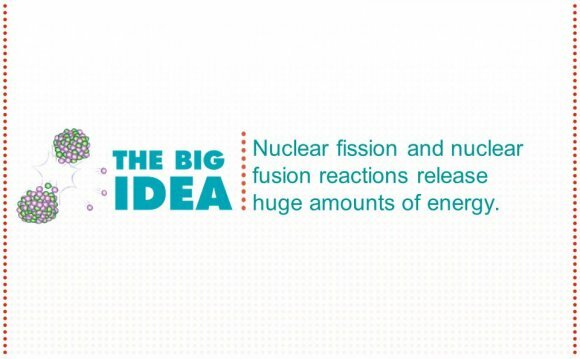 Fusion releases more energy than fission because the mass lost during fusion is more than that lost during fission. One of the practical application of nuclear fusion is hydrogen bomb.